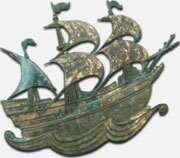 In 1623, a grant was issued to a group of merchants from England who wished to establish a trade settlement overseas. John White, a reverend in Dorchester, England at the time, aided the group in securing the patent. 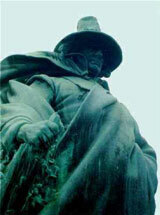 The Dorchester Company, as it was then called, sent just 14 fishermen across the Atlantic Ocean. They landed on Cape Ann and set up a fishing outpost called Gloucester. That same year, a non-Separatist named Roger Conant had arrived in Plymouth with his family. Finding himself ill-suited to the strict Pilgrim society, Conant moved up the coast to the town of Nantasket in 1624. A year later, Conant was asked by the Reverend White and the Dorchester Company to oversee the floundering settlement on Cape Ann. Conant acted as governor of the Cape Ann settlement, but it still did not prosper. In 1626, the settlement failed. Declining the Dorchester Company's offer of return passage to England, Roger Conant led a group of people from Cape Ann down the coast to found a town called Naumkeag. They hoped a less exposed landscape would allow for more successful farming. The following year was no more successful than the previous three, and, despite the lure of moving south for warmer Virginia, Conant decided to remain in Naumkeag. In September of 1628, the Council for New England issued a patent to Reverend John White, which allowed John Endecott and a group of new settlers to inhabit the colony of Naumkeag. Endecott was commissioned to take over as governor of the settlement, much to the dismay of the original group of settlers. Endecott renamed Naumkeag, calling it Salem, which is the Hebrew word for "peace." The new governor soon enforced his strict Puritan beliefs by cutting down a May-pole that the Dorchester settlers had put up and sending people back to England for reading an Anglican Prayer Book. In March of 1629, Governor Endecott and his associates requested and were granted a royal charter declaring them a corporation under the name the "Governor and Company of Massachusetts Bay in New England." Several hundred more Puritans crossed the Atlantic to settle in Salem, and in April of 1930, John Winthrop arrived. He brought with him the "Cambridge Agreement" that would place him as the new governor of the colony as well as the governing head of the Massachusetts Bay Company. Soon after Winthrop's arrival, the first Puritan church in New England was organized. Samuel Skelton was chosen pastor, with Francis Higginson as Skelton's assistant. After being ordained in a simple ceremony, they preached to the settlement under the shade of Salem's great elm trees. Thirty people signed the covenant, thereby officially establishing themselves as a church. The Massachusetts Bay Company was quickly transformed from a trading business into a theocracy run by staunch Puritans. The requirement to vote and to be a stockholder in the Company was church membership, not land ownership as in the other colonies. More and more colonists joined the Massachusetts Bay colony, arriving by the thousands beginning in 1630. 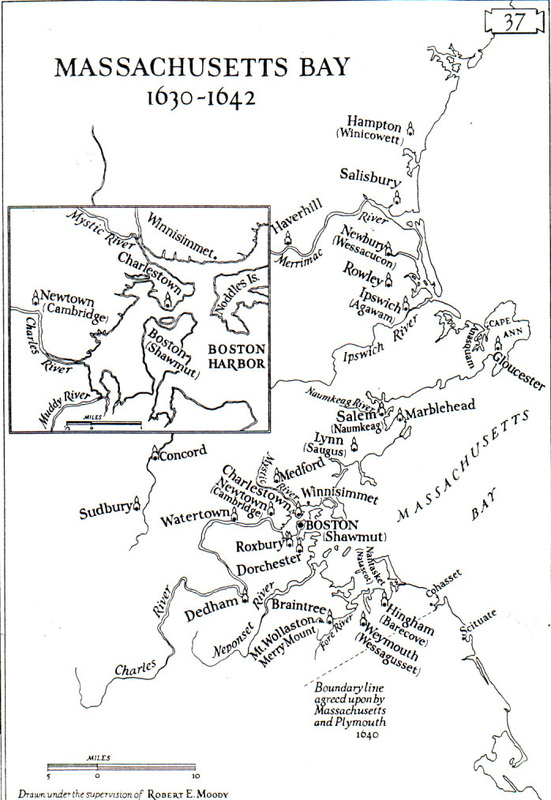 The ships arrived first in Salem, but soon a permanent settlement was established on the Shawmut Peninsula of Massachusetts Bay, which later came to be called Boston. More settlements soon popped up around Boston, including Newtown (later renamed Cambridge), Lexington, Concord, Watertown, and Charlestown. The Massachusetts Bay Company and the colony were actually the same body until 1684 when the charter would be revoked. journeys of the Mary and John. Reverend John White succeeded in gathering together another pioneering party of about 140 colonists who sailed from Plymouth, England on the Mary and John on March 20, 1630. Nearly all of these families came from the counties of Somerset, Dorsetshire, and Devonshire. Before sailing, the group gathered as a congregation and selected Reverend John Warham as their pastor, with Reverend John Maverick as his assistant. The Dorchester company put ashore at Nantasket on May 30, just a week and a half before the Winthrop Fleet arrived. They soon found pasture for their cattle at Mattapan, which they renamed Dorchester, in honor of the Reverend John White, of Dorchester, England. Dorchester became the first permanent settlement in present-day Suffolk County, and it was under the jurisdiction of the Massachusetts Bay Colony headed by Governor John Winthrop. Settlers lived in Dorchester as Puritans until they clashed with Governor Winthrop. He thought that government should be run by only a few people, while the Reverends John Maverick and John Warham thought it should be run by the people who elected their leader. Winthrop's ideas were unacceptable to the people of Dorchester. Thus, in October 1635, the majority of the Dorchester congregation turned their attention toward the fertile meadows of the Connecticut Valley, hoping to take advantage of the lucrative fur trade there and establish their own town. About 60 men, women, and children led by Roger Ludlow, owner of the Mary and John, set forth from Dorchester to Connecticut in October. Their furniture and other heavy possessions were sent around by water. The party took a route known as the Old Connecticut Path, which led them through swamps, rivers, and over small mountains. After 14 days, they arrived safely at their destination, an area known to the local River Indians as Matianuck and where a few colonists from Plymouth had settled two years previously. Winter was upon the party before they were settled or prepared. The river froze over in mid-November, and the ship carrying their provisions could not sail upriver. By December, their meager supplies gave out, and they faced starvation. A few returned to Dorchester, but most survived the winter with help from the original Plymouth settlers and the Native Americans. In the spring of 1636, the settlers moved up out of the flood melt zone, and they built houses in the meadow north of the river. The original Plymouth settlers had purchased that land from the Native Americans, but the Dorchester people made it their home. Reverend Warham called the settlement Dorchester, and a final name change to Windsor occurred in 1637. The church that Warham began remains in Windsor, Connecticut, to this day. U-S-History.com. "Massachusetts Bay Colony." Accessed 7/02/13. Mary and John: Ship Monument to Original Settlers | Photo by BruceS, 2011; Waymarking - Groundspeak, Inc.